After three days of Hurricane Harvey, the message emerging from Houston and the Texas coast is not one of chaos and destruction, but of collective strength, as Americans help each other survive through the worst of circumstances. For once, cable news is not dominated by talking heads shouting at each other, but by images of volunteers, black and white, arriving in flat-bottomed boats to rescue neighbors from flooded buildings. Journalists are helping to direct emergency crews to save stranded drivers rather than encouraging enraged mobs to riot against the police. And President Donald Trump, attacked for weeks for allegedly dividing the nation, is drawing attention to its unity. Tragic times such as these bring out the best in America’s character. Strength, charity and resilience are those characters. We see neighbor helping neighbor, friend helping friend, and stranger helping stranger. And you see that all over. If you watch on television, you just see such incredible work and love, and teamwork. We are one American family. We hurt together, we struggle together, and, believe me, we endure together. We are one family. Remarkably, President Trump is winning praise for the federal government’s management of the crisis thus far. He is planning to visit the region on Tuesday, avoiding the mistakes made by his two predecessors. George W. Bush infamously flew over the devastation of Hurricane Katrina; Barack Obama, knowing he would never be held to the same standard, golfed on Martha’s Vineyard during massive Louisiana floods until Trump shamed him into visiting. 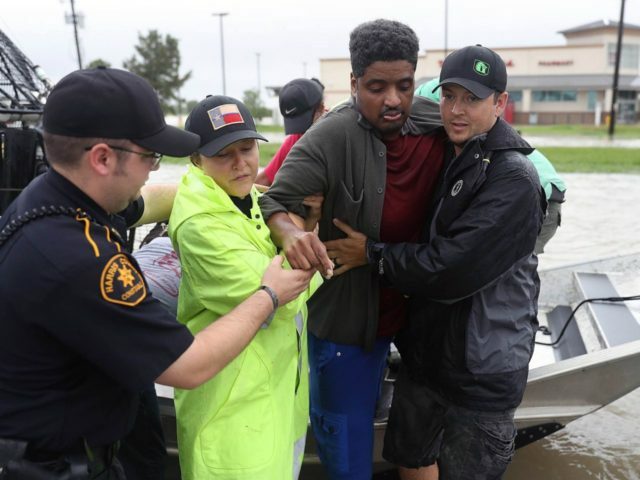 Most of all, the story of Hurricane Harvey is about what Americans can do without government: the neighbors who are giving each other shelter from the storms; the “Cajun Navy” from Louisiana, a volunteer armada of small boats, en route to help with search and rescue efforts; the non-profit organizations organizing grass-roots relief efforts. All of that is happening, notably, in the South — a region the left had targeted for a miniature Cultural Revolution in recent weeks, as mobs swarmed historic Confederate memorials (or anything old enough to be held in suspicion). The South was deemed by its cultural betters to be just as backward and racist as ever, a living rebuke to the nation. Instead, the people of Texas are showing the world that beneath the mindless political rhetoric, we remain united and strong. The political winner thus far is President Trump. The real winner is us, the United States of America.